You have found some of the best wild goose recipes. Recipes so good they are featured on OutdoorChannel.com. 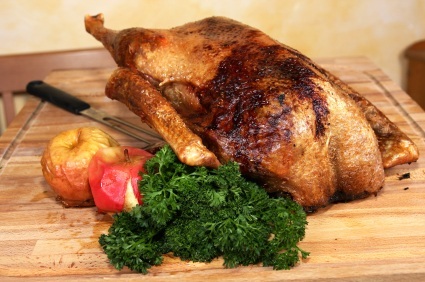 Delicious roast goose with crispy skin, a tender goose crock pot recipe and much more. Offering many more homemade game bird recipes for you to choose from. 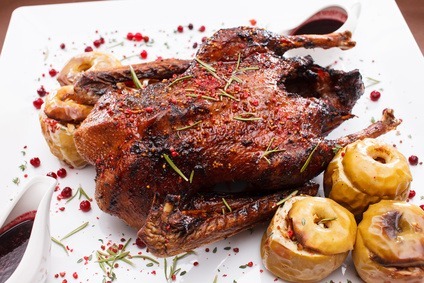 If you do not have hunters in the family, and you want to make one of these recipes, you certainly can purchase a goose (especially around the holidays). You will now be an informed shopper and know what to look for. Fresh goose is available during the Christmas season and an awesome choice for any of these goose recipes. Make sure the goose is plump, well formed, and has smooth, blemish free skin and free of pin feathers. It is so hard to judge the quality of a frozen goose, so please stick with the well known brands. A 10-12 pound goose is the biggest bird you should buy because the larger ones are almost always tougher. The 10-12 pound goose may feed up to 8 people depending on how much your family eats and if you want leftovers. Instead, consider buying two or three geese (instead of the bigger birds) if you need to. It is very deceptive because the geese do have a large carcass and relatively little meat, compared to, say, a chicken. Allow the goose to thaw 2 days in the refrigerator. Or you can thaw the goose for 5-6 hours in cold water in the original package in the sink; changing the water frequently. Now on to preparing one of my goose recipes. I believe that game birds are the the most delicious wild meat, and the key to this is that prepping the bird is as important as how you cook the bird. Take care of the bird as soon as you've bagged it, so when you use one of my recipes for goose, it will be wonderful. If you can freeze the bird one week before cooking it, the freezing tenderizes the bird and there is no need to marinate it (keep this to yourself). Secret #1: Goose is stronger tasting than any wild duck (it's like roast beef texture), so I marinate the goose in buttermilk (or milk) for 24 hours in the refrigerator before cooking. If you want to marinate the goose in a "flavored marinade," (like orange or savory, etc.) rinse all of the buttermilk from the bird and marinate your bird again. You know that a turkey (domestic or wild) needs to be basted in fat to stay moist - but the goose is just the opposite. The rendered fat that accumulates on the bottom of a roasting pan needs to be discarded. Secret #2: PRICK JUST THE SKIN AND THE UNDERLYING FAT OF THE GOOSE with a fork or a needle; do not prick the meat. If you can, pull out any pads of fat before cooking. Secret #3: BOIL 1 cup of water and pour over the goose before seasoning it and placing it in the oven, and midway through baking, to melt the fat. It will crisp the skin and prevent the goose fat in the roaster to catch on fire. This wild goose recipe is wonderful because you can prepare it before you go to work and it's ready when you come home. In a heavy skillet, melt the butter over medium high and quickly brown each piece. Place the browned goose pieces into your crock pot and set it to high heat. Add the garlic cloves, onion, worcestershire sauce and broth. Slow cook for 6-8 hours, or until the meat falls off the bone. Shred with a fork and mix with your favorite barbecue sauce. Thanks for using my recipes for goose; these are great sandwiches, don't you think? 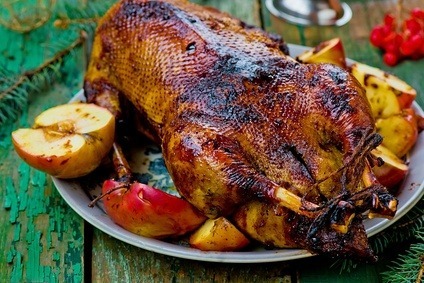 This goose recipe is easy to prepare and so delicious. Saute mushrooms in 2 tablespoons of butter until tender. Meanwhile, place the goose meat in a saucepan with beef broth. Add the onion, celery and beef bouillon cube; simmering until bouillon cube has dissolved and hot. Slowly whisk in the flour, stirring constantly until it thickens. Add meat, mustard and sour cream. Heat until just below boiling point. Serve over hot buttered rice or noodles and add a dash of paprika. The next goose recipe includes this delicious dish. If you like mushrooms, you will love this. In a large heavy skillet, melt the butter or bacon fat on medium-high heat. Add the goose, onion slices and minced garlic; brown both sides of the bird. Reduce the heat and add the chicken broth and bay leaf. Simmer for 1-1/2 hours, covered. It's time to add the mushrooms, sugar and thyme. Discard the bay leaf and season with salt and pepper to taste. Cover and simmer another 30 minutes. Serve with wild rice. I have more than just recipes for goose. Check out more of my favorites at the navigation bar to the left. PREHEAT the oven to 350 degrees and spray a roasting pan with vegetable oil. Wash the goose well and pat dry. Sprinkle the cavity with the 1 teaspoon of kosher salt and prick the skin generously; set aside. In a skillet over medium-high heat, add the butter and saute the celery and onion until tender. Pour into a large bowl. Add the chopped apples, bread, white sugar and remaining teaspoon of kosher salt; toss. In a bowl, whisk the eggs, apple juice and broth together and pour 1/4 cup at a time over the stuffing mixture. Toss well and lightly stuff the goose. Bake, uncovered, for 3 to 3-1/2 hours or until a thermometer reads 185 degrees. Let the bird rest for at least 20 minutes before carving; remove the stuffing and cover to keep warm. Start a new tradition for the holidays. This particular goose recipe requires 4 hours of marinating before roasting; and so worth it. In a saucepan, combine the ingredients and bring to a boil. Reduce heat and cook uncovered until the celery is tender; stirring frequently. Cool to room temperature. Place your goose in a large resealable bag and pour the cooled marinade over the bird; turn to evenly coat. Refrigerate for 4 hours, turning every hour. Bring the goose out of the refrigerator and discard the marinade. PREHEAT the oven to 325 degrees and spray a shallow roasting pan with vegetable oil. Rub the outside of the goose with the canola oil. In a small bowl mix the cinnamon and garlic powder together; rub over the entire bird. Bake, uncovered for 30 minutes. Meanwhile in a saucepan, combine the 2 cups of water with the cider vinegar, 1 tablespoon of soy sauce and honey. Bring to a rapid boil and simmer until it is reduced in half. Bring the turkey out of the oven after 30 minutes and brush the entire goose with the honey mixture; lightly sprinkle with salt. Place back in the oven and cook another 30 minutes. Now cover the goose with foil and cook until done (1-1/2 to 2 hours) or when a thermometer reads 180 degrees. When cooked, bring out of the oven and let it rest, covered for 20 minutes. DO NOT prick the skin when it is resting or you will loose all of your juice. For the gravy, strain the pan juices and discard any fat. Mix the cornstarch with the water in a small saucepan and whisk until smooth. Now add the pan juices and bring to a boil, cooking for 2 minutes or so. Carve your goose and serve with the gravy. Served with cranberries and rosemary on the platter. Here is another one of my goose recipes that is so tasty. Instead of blackberry jelly, you may also use raspberry or any other fruit flavor you wish. PREHEAT oven to 325 degrees. Lightly spray a roasting pan with vegetable oil. Lay carrots, celery and onion slices on the bottom of the roasting pan. Pierce skin ONLY. Mix the fruit jelly with the brandy and baste the goose with this mixture every 15 minutes. Roast for two hours, or until internal temperature reaches 180 degrees. Serve with wild rice. 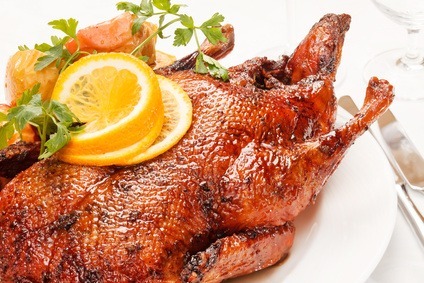 This goose recipe is easy to prepare. Just put it together in the morning and when you get home from work - dinner is ready. Spray the slow cooker crock well with vegetable spray. Place the goose strips in the bottom of the slow cooker and cover with the onion slices. Mix the remaining ingredients together and pour over all. You may add 1 tablespoon of flour to the drippings and make gravy after the goose is cooked. I have more than just goose recipes, check out the links below.